For all you mono-ists out there, this is a nice 'n simple method of adding film grain to your images in a non-destructive manner. Those that can't be bothered to follow the instructions, I've created an action linked at the end of this tutorial. You might as well name it too. Also, if you like, you can set the Blend Mode to Overlay. Doing this now will let you preview the effects of steps 4 & 5. 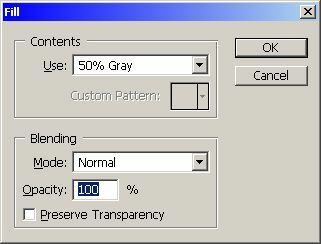 Fill the layer with 50% grey. The easiest way is to press shift+backspace and the following dialogue is shown. Alternatively you can simply fill the layer with the paint bucket and a colour sent to 50% grey. Choose a value you like. 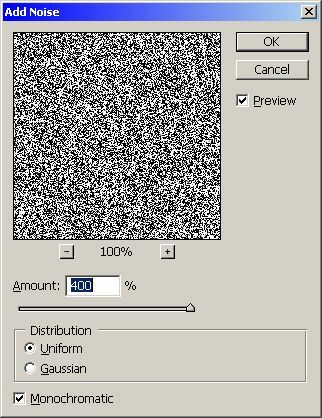 If you set the Blend Mode of the layer to Overlay in step 1 then you should be able to see the effect of the blurring. Around 1.7 pixels seems to do it for me. 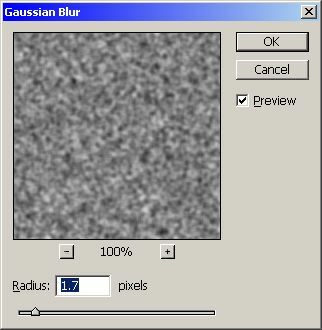 Be aware, the blur will probably depend on the resolution of the original image. At the time of writing, I'm working on 6MP images. 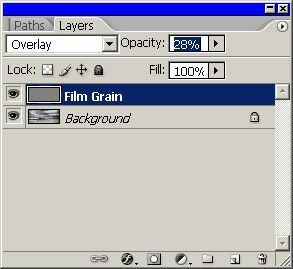 If you haven't done so in step 1, set the blend mode of the film grain layer to Overlay. 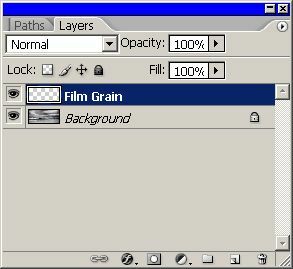 It's likely the grain effect is rather strong, to reduce the strength, use the Opacity slider to lower the amount of effect. Thats it! Easy peasy lemon squezy.